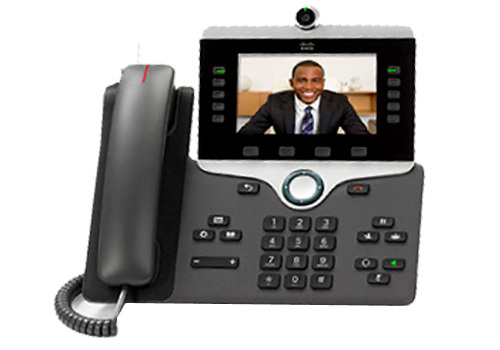 The advanced Cisco IP Phone 8800 Series is a great fit for small to large businesses seeking high-quality, full-featured VoIP communications. Select models provide cost-effective entry to HD video and support for in-campus mobile workers over Wireless LAN networks. The 8800 Series is ideal for knowledge workers, as well as administrative, managerial, and executive staff. It also works well in shared workspace environments. With the Cisco Spark Phone OS, the series provides flexible deployment options, whether Cisco on-premises, from the cloud, or in a hybrid configuration. The portfolio is well suited for current customers who want to expand their investments in Cisco desktop video and voice communications. The 8800 Series can also support customers who have or are considering investment in UCaaS from other Cisco select service providers. Ruggedized voice communications for your in-campus mobile workforce with Wireless IP Phone 8821 and Wireless Phone 8821-EX. Spark Phone OS common to the IP Phone 8800 Series and IP Phone 7800 Series reduces administrative costs. Phone models and telephony features may vary by vendor platform. Consult your third-party call control vendor for details on feature and models supported. 802.11 Wi-Fi is supported on 8861 and 8865 models only.